Truckers attend a protest against high diesel fuel prices at the Company of Warehouses and General Warehouses of Sao Paulo (CEAGESP), in Sao Paulo, Brazil May 28, 2018. A nationwide truckers’ strike that has paralyzed large parts of Brazil’s economy was winding down in some areas of the country on May 29 but still in place in others after the government of President Michel Temer made concessions to lower diesel prices. The government has announced tax cuts and subsidies that would shave about 12 percent off domestic diesel prices. Diesel prices would remain frozen for 60 days and thereafter state-controlled oil company Petroleo Brasileiro would adjust them monthly rather than daily. 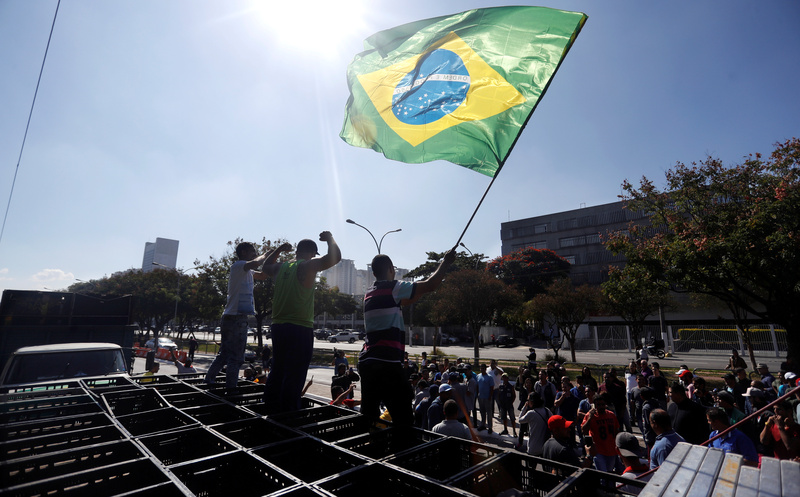 Petrobras said the government would compensate it for any losses. Petrobras’s shares fell 15 percent on May 28, but rebounded more than 9 percent by around noon EDT on May 29. The real currency also lost about 1.6 percent on May 28, and was flat around noon on May 29. The truckers were protesting diesel prices that have risen because of higher global oil prices and a weaker Brazilian real. The country’s antitrust regulator on May 29 released a plan to increase competition in the fuels market, which could lower prices in the medium term.